A lobbying group that has supported Gov. Chris Sununu’s energy policies wants federal regulators to invalidate a new state subsidy for the biomass industry. The legislature passed the subsidy by one vote, over Sununu’s veto earlier this year. It will require utilities to buy energy from biomass and trash-burning power plants at a discounted rate, passing the extra cost onto customers, for the next three years. Proponents say the state’s forest products industry needs those plants as a market for low-grade timber. Now, the nonprofit New England Ratepayers Association has asked federal regulators to declare that the bill violates federal energy laws. Association president Marc Brown says essentially, the bill has the state set a wholesale energy rate -- something only the feds can legally do or delegate. Brown says the subsidy will increase energy costs by six figures for some of his group’s commercial and industrial members, who he declined to name. Another bill passed this year extends a deal between Eversource and the Burgess BioPower biomass plant in Berlin. Brown says they opposed that bill too, but it amounts to a "voluntary agreement" lawfully administered by the state Public Utilities Commission, and so they left it out of this request. Federal regulators have set a Dec. 3 deadline for any other parties to file comments on the filing. If those regulators decline to issue the order Brown has requested, he says it would set a troublesome precedent and he might take the matter to court. 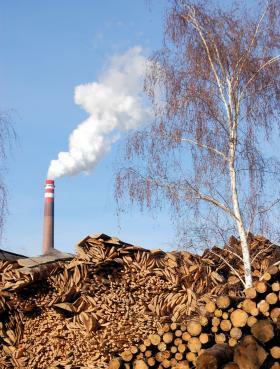 A lawyer for the state’s biomass and timber industries did not immediately respond to a request for comment. The New Hampshire Public Utilities Commission's consumer advocate and Eversource have both sought to intervene in the federal petition. This story has been updated to include information about intervenors in the Ratepayers' request. Members of New Hampshire's energy industry joined lawmakers Monday at the state’s annual energy summit, which helps set priorities for next year's legislative session. They debated the policies – and politics – that could help lower the region’s high electric costs, diversify and stabilize fuel supplies, and reduce reliance on imported fossil fuels. Governor Chris Sununu and Democratic rival Molly Kelly presented contrasting ideas on those issues at the start of the summit. State legislators vote Thursday on whether to override two controversial vetoes of bills about energy. One would subsidize biomass power plants. The other would expand net metering in New Hampshire. Governor Chris Sununu says both bills would cost residents and businesses too much. But supporters from the state’s established timber industry and its newer renewable energy sector disagree. Under a 2011 agreement, Eversource pays Burgess at above-market prices. That's capped at 100 million dollars, but that could be reached sooner than anticipated.